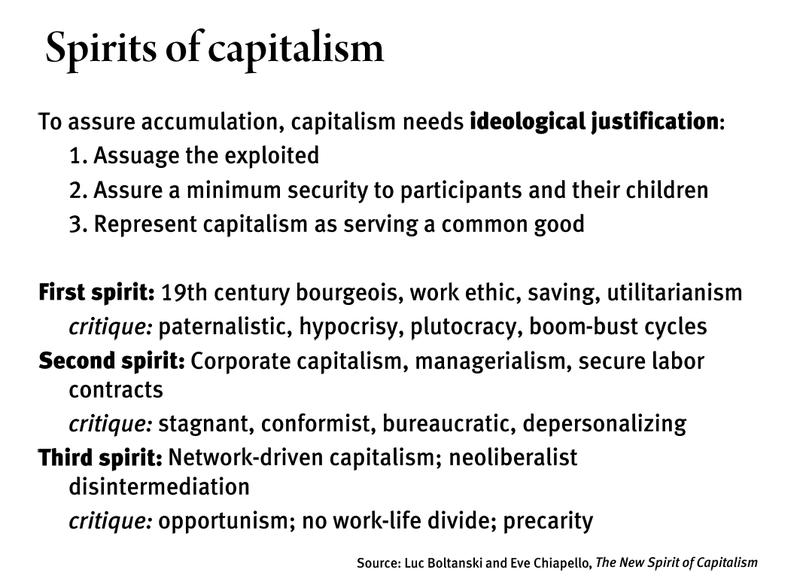 Another way of understanding the dynamism of capitalism is through its continual need to produce a flow of “abstract labor” as well as opportunities for profit. 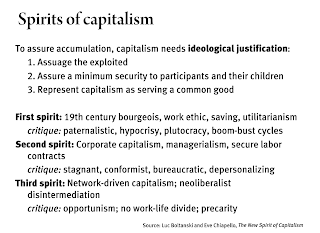 Capitalism presupposes an ever expandable amount of needs to satisfy with commodities and thus an ever growing amount of potential work to produce those commodities. Thus it requires a general sense that work is fungible or “abstract”, measurable as a certain amount of money (a wage). And it requires a sense that any activity whatever on the part of a worker can be productive, as value inheres in human effort itself. In capitalism, the value of labor is not contextual and contingent, not dependent on traditions and secure, stable structure of productive relations (think the mythical precapitalist community, with little class mobility and hereditary rank and occupations), but is “liberated” to be deployable in whatever ways suit capital; capitalism thus remakes local, traditional arrangements in its image. Workers becomes nothing (no integral identity is given, in theory), but have the potential of making anything, and must make something of themselves. This is the source of capitalism’s power to bring novelty into the social world. The formation of social bonds becomes a source of value -- the power of cooperation, the creation of value that exceeds the independent effort of any one person. Capitalism must be able to attract or codify this sort of “living labor” and render it “abstract labor” amenable to rationalization, measurement and control -- the sort of labor that can be the input to a profitable production process. 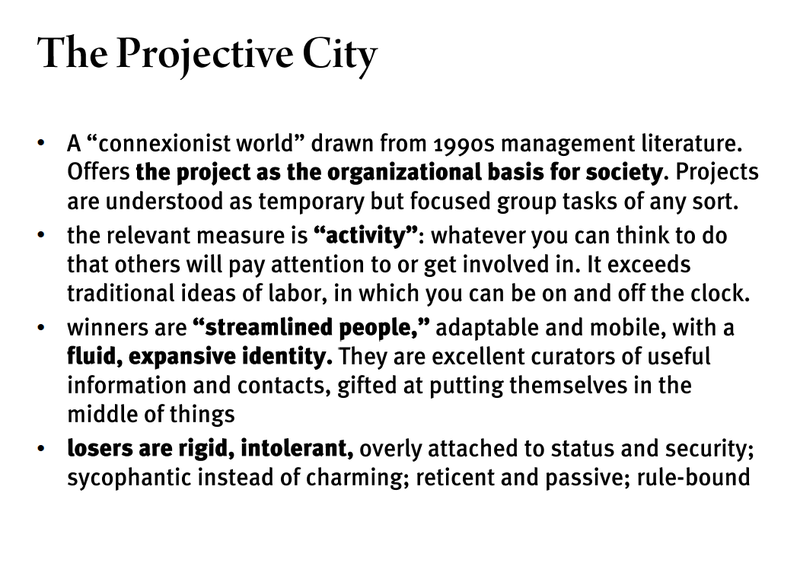 Hence a fundamental problem for capitalism: how to maintain a supply of workers who are (a) flexible, creative, and motivated at the same time they are (b) manageable, controllable, and predictable. Abstract labor is the quantification of the self, making that labor of self-creation and identity shaping productive by allowing it to conform to pre-existing measuring tools that allow for commodification. A matter of fitting oneself to the yardstick. The capitalist development of technology has in part been driven by a need to render “living labor” into “abstract labor” without snuffing it out altogether. Put another way, it’s not only machines that embody technical knowledge to improve productivity, but also subjects, who are freed to produce new needs and hence new opportunities for profit. 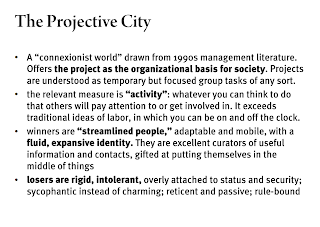 Subjectivity becomes a developed from of capital, with an enhanced productive potential. (We think to want more; we are determined to express ourselves in original ways; we are driven to discover ourselves rather than take our identity as given and fixed.) The development of machinery and now computer technology and augmentation nullifies inherent differences and particularities in users, leveling pre-existing human variety while producing an urgent need to manufacture new distinctions. It takes pre-existing qualities, makes the quantifiable and then uses those quantities to impel production. Capitalism requires labor as such (abstract labor). But this prompts the critique that work is personally meaningless, alienating. To answer this critique, capitalism must make the process of valorization in production into a kind of self-production for workers at the same time. What enables this is the underlying ability to transform life experience (self-production, self-expression, relationship forming, etc.) into something abstract and redeployable behind the scenes by capitalist firms: data. 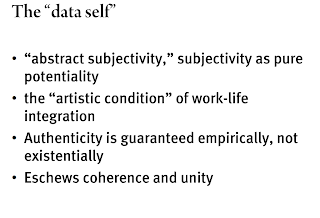 Work (now becoming -- in ideology, if not in actual fact -- a matter of “immaterial labor” -- the filtering of production through lifestyles, branding, symbolic layering) can become meaningful and social and self-fulfilling because it is at the same time generating data. 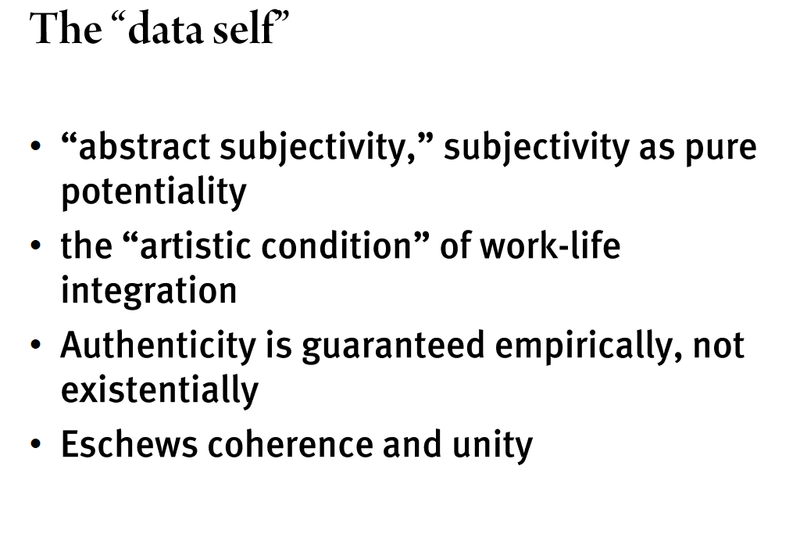 The data self is the sort of capitalist subject that experiences its “alienation” as liberation and an open-ended process of self-discovery; it experiences the quantification of life (once strictly a matter of reducing human effort into abstract labor power measured in wages) not as alienating and reductive but as positive, descriptive, self-defining, revealing. 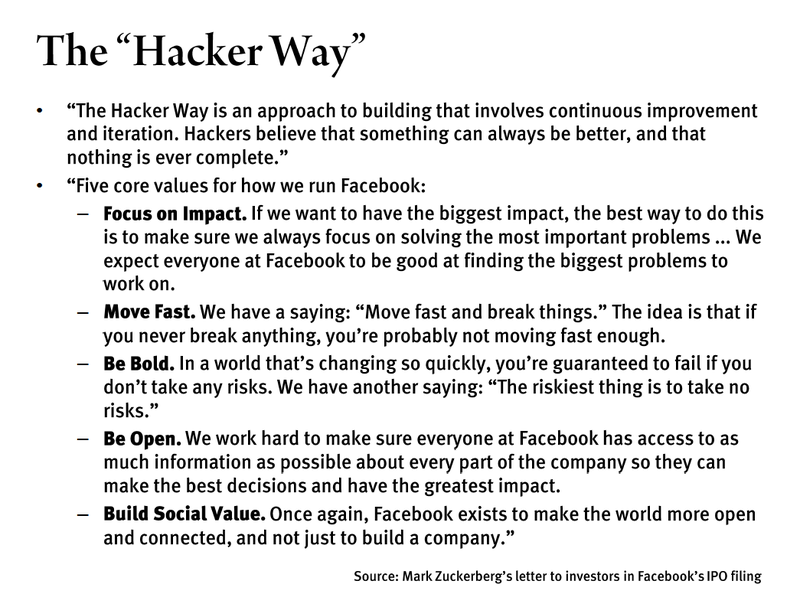 All Facebook profiles in theory are born equal; they allow the same exact repertoire of actions to shape and improve them. It seems like an opportunity and a medium in which to develop the self, but it is also a way to contain and control those efforts, making sure they are producing value within capitalism (rather than liberation from it). 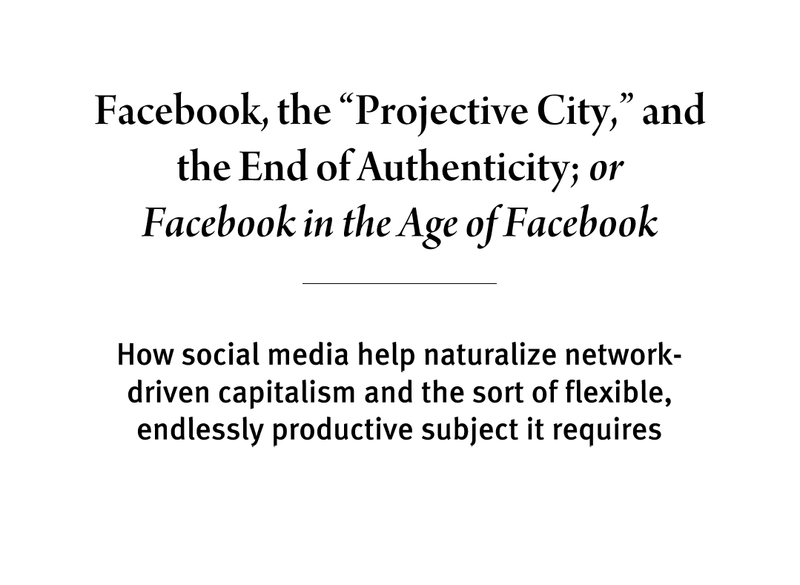 Social media extend the experience and range of applicability of living labor while simultaneously transforming it into “abstract labor” -- into fungible data. They attempt to control and capture the productive capital of subjectivity engendered by capitalism in liberating us from our stable place in traditional hierarchies and so on. 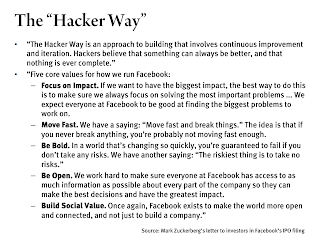 They give shape to the emerging social factory, integrating it into existing ways of doing business, prompting investment flows, and harvesting and distributing profit. 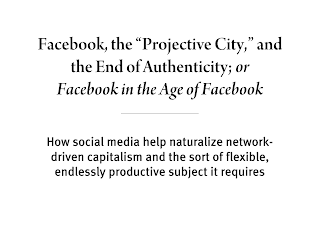 Social media are part of the new spirit, part of network-driven capitalism’s effort to justify and limit itself to make sure it doesn’t become too immiserating to continue. 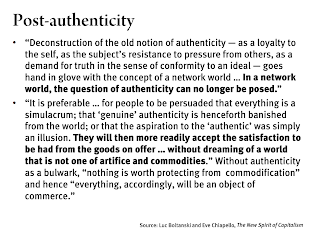 Social media presuppose the conditions of their popularity (network capitalism) are permanent, present themselves as solution to what they are actually instrumental in causing and perpetuating. They ameliorate the ideological crisis that stems from the conflict between abstract and living labor. 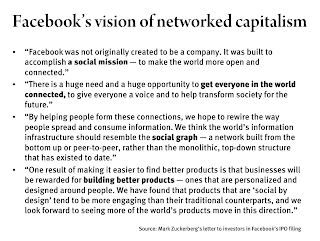 Social media are ways to contain and recapture the productive and potentially disruptive energy of the cooperation engendered by the capitalist production process, which depends on bringing workers together, dividing labor among them, and generating/capturing the surplus that emerges from their effort to work together. 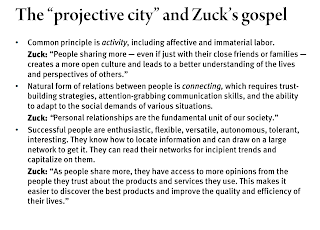 Cooperative efforts are captured within social media and made into data -- that is, they are made fungible, abstract, countable. This data can set cooperative workers back into competition with one another, now competing over and in terms of measurable influence, attention, contribution, network links and so on. Raven examines the British book business in the second half of the 18th century, explaining how the book became more of an everyday commodity as the reading public expanded. The growing market led to a streamlined product to meet it, which in turn grew the market further. With books, this meant genre formulas were refined and generalized so audiences would know what they were getting. Critics of the period recognized this; one likened fiction to a "drug" engineered to be addictive through its standardized tropes and stereotypes. But Raven's main concern, as the title suggests, is the prominence of stories about the nouveau riche, the demand for which was inexhaustible in the period -- unsurprisingly given the middle class makeup of the new reading public. The fiction of the era catered to a need in readers to disavow their own dubious origins and established a different means for establishing character than bloodlines, namely the sensibility to appreciate fiction and respond emotionally to it. Part of what happens is that taste stops meaning aristocratic discrimination and starts meaning the ability to be ahead of the fashion curve. Those are often the same thing in practice, if you think fashions emerge from hierarchical emulation. But the shift in emphasis indicates a shift in imagined possibilities -- the new commodities allow one to believe that taste can be achieved. No longer a matter of blood but a matter of wise consumer choices. The book market is microcosm of the larger democratization of taste through open markets in fashionable goods. This has destabilizing effects throughout the class hierarchy, prompting an acceleration in the cycling through of signifiers of status. 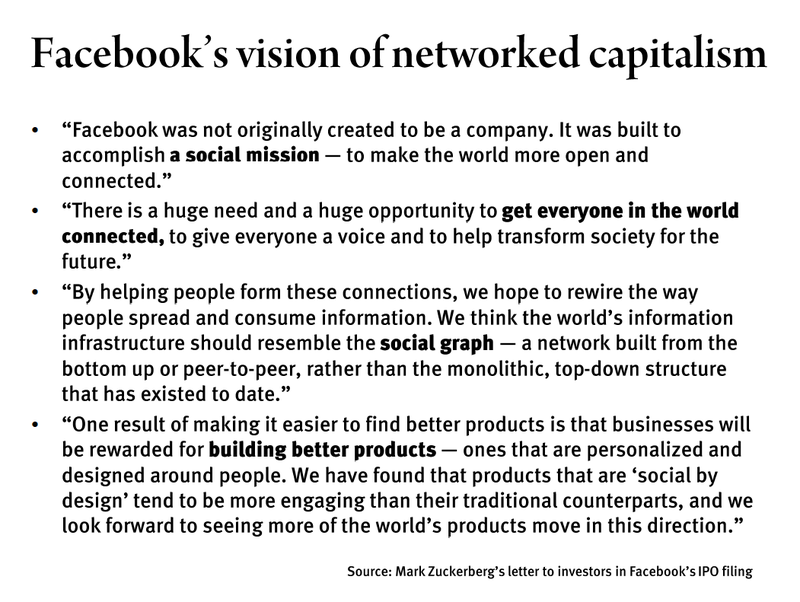 This acceleration with urgently spun as freedom by capitalism's ideologues, and who knows? Maybe they were right. We can't project backward and know whether we would have enjoyed the "ontological security" of being consigned for life to a particular social caste. Perhaps Gilles Lipovetsky is right and fashion is a small price to pay for social mobility (even uneven and imperfect mobility). But this is certainly an important basis of emerging consumerist ideology — the right to have Meaningful Taste and to find life's purpose in it rather than upholding one's place in the Great Chain of Being. Raven notes the apparent contradiction in the substance of commoditized books: They promise to inculcate proper social conduct, but their form is engineered to teach one simply to become addicted to reading more books. The form says "consume more," regardless of content -- this is basically true of all commercial media products. The worship of novelty is built in, so the allegedly permanent, always true ethical advice or aesthetic taste these early books could offer was always compromised. They offered the experience of having learned the "last word" about some moral or aesthetic question as something you could consume again and again -- moral certitude as a commodity. Experiencing morality (or connoisseurship) vicariously as entertainment replaces the need to act morally in the world to demonstrate that one has learned and understood some precept. The new reader's yearning for permanence is leveraged into an appreciation for the exhilarating experience of ephemerality. This is how commoditized books, commercial fiction reproduce their market, making these contradictory desires cohere, coexist. 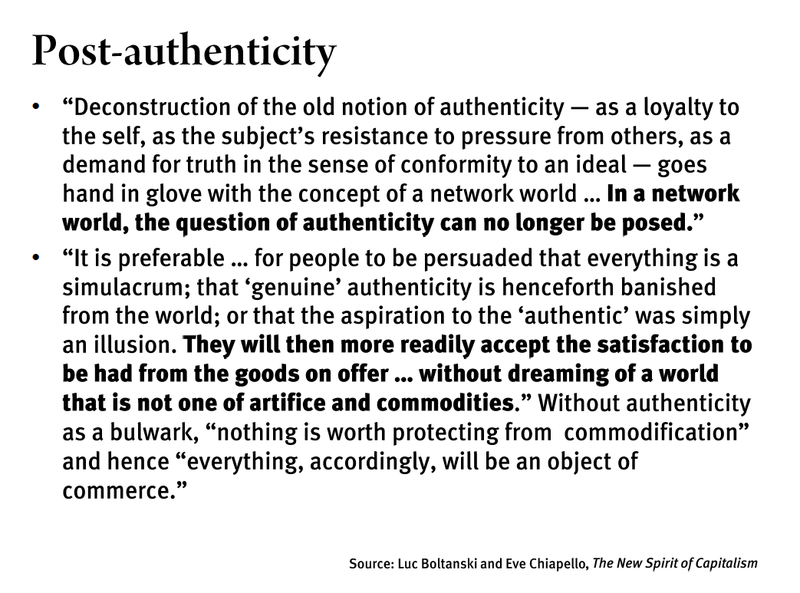 Media consumption in general perhaps performs this work, manufacturing a necessary illusion for capitalism, that one can consume one's way to solidity, that one can experience stability serially, as a string of vicarious consumption experiences.